"WINTER's amazing true story... now has HOPE." 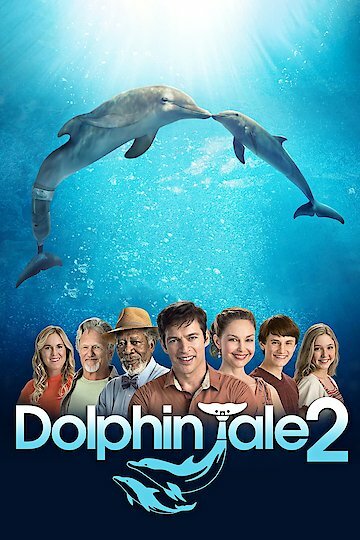 Dolphin Tale 2 is the dramatic film sequel to the 2011 Dolphin Tale movie release. It focuses on the day to day activities of Dr. Clay Haskett and the staff and volunteers who work at Clearwater Marine Aquarium located in Clearwater, Florida. It updates the audience on the continuing adventures of a courageous dolphin named Winter who managed to survive against all odds despite the loss of her tail. It also features the friendship that Winter develops with a much younger dolphin named Hope, who was discovered at the same location that Winter was almost 5 years to the same day. Audiences will recognize many of the same beloved animal characters that were featured in the original Dolphin Tale movie, including Rufus the Pelican. New to this sequel is the story of another rescued dolphin named Mandy, brought to the Aquarium in order to be rehabilitated in order to see if she will survive a re-entry back into the open water. Also starring Harry Connick Jr.
Dolphin Tale 2 is currently available to watch and stream, download, buy on demand at Netflix, Amazon, Vudu, Google Play, FandangoNow, iTunes, YouTube VOD online.